The Park Avenue Diet is a six-week program that was created by Manhattan internist, Stuart Fischer, MD, that is designed to help you achieve the look of the rich and famous. Fischer says that looking good is about more than just diet, so his plan includes a lifestyle makeover that covers beauty, fitness, fashion, and poise. According to Fischer it is necessary to address seven fundamental components in order to have the best chance of physical and mental self-improvement. These include weight, physique, hair, skin, clothing, self-confidence, and interpersonal skills. Fischer brought together a team of experts for his book, each of whom offers a chapter covering one of these components. The dietary aspect of the Park Avenue Diet involves a highly restrictive low calorie diet that includes three meals and one snack daily. Daily calorie intakes average at about 1300 calories. Dieters are required to eliminate all sweets, artificial sweeteners, alcohol, fruit juice, and milk. The low calorie diet is designed to be followed for six weeks only, during which dieters are told they can expect a weight loss of one to two pounds per week. Fischer says that dieters will be able to maintain their weight loss thereafter by sustaining the fundamental principles that are learned throughout the program, however, no specific guidelines are offered for maintenance. Fruits, vegetables, lean meat, seafood, legumes, dairy products, and whole grains. Look for other low Calorie meal ideas here. The Park Avenue Diet includes descriptions of exercises that can be done at home and includes a plan for six weeks with the intensity level increasing over time. 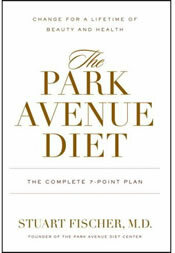 The Park Avenue Diet: The Complete 7 – Point Plan for a Lifetime of Beauty and Health retails at $25.95. Low calorie diets in combination with exercise generally produce positive results for weight loss. Includes daily menu plans with recipes. Addresses psychological factors involved in weight management. Offers advice about beauty and self-confidence that are unique to this program. Restrictive and eliminates many foods including alcohol. Meal plans are very low in calories and many dieters may experience hunger or fatigue. Difficult to sustain exercise on a low calorie diet. Does not provide a maintenance plan. High chance of rebound weight gain when normal eating is resumed. Many of the recipes are high in sodium. Will probably not appeal to most male readers. May require a fair amount of time investment to address all seven components as well as for food preparation. While a reduced calorie diet in conjunction with exercise has been shown to result in successful weight loss, experience has shown that the majority of dieters will regain the weight when normal eating is resumed. The Park Avenue Diet will most appeal to dieters who are interested in advice about beauty and self-confidence in addition to a diet and fitness plan.